Serve on bread, in a tortilla, in a lettuce or cabbage wrap or with veggies to scoop. You did great! I like how you talked about the salt and pepper shakers and gave suggestions for what to serve it with! I love egg salad, why have I never had it with bacon?!?! I will definitely be trying this out soon! Great job on your first video Pepper!! I loved the tip about the scissors. I never would have thought to do that. I made this after Easter to use up Easter Eggs. 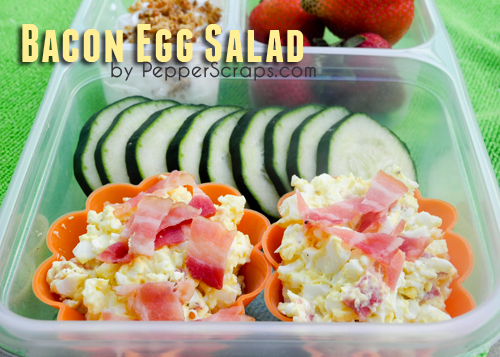 I’m not really an Egg Salad Fan, but I loved this version. This sounds really good. I’m gonna have to try it. Great video, love bacon with eggs! You did a fabulous job Pepper. I like egg salad! I too liked the tip about the scissors and your salt and pepper shakers.